Facilities available to guests include a house, a Fare potee (outdoor lounge), a sanitary “fare” (house) with bathroom, toilet and laundry. The house is built in a style typical of the Tuamotu : a wooden structure, plywood and sheet-metal roofs, and has several levels. It has three single rooms. An upstairs bedroom, equipped with a double bed. The other two bedrooms each have a double bed and a single bed. The rooms are simple and colorful, airy and well-ventilated through natural ventilation, equipped with mosquito nets, fans and cupboards. A study area, a library and a storage space are on the same intermediate. The lounge is a very open space, including a U-shaped settee, that may provide six extra sleeping places. The dining area has a table for eight. The kitchen is open and fully equipped. The set is a comfortable family home, very open and friendly. The “Fare potee“ (outdoor lounge), which is a covered area a few metres from the kitchen, is made of a wooden structure, with a roof made of coconut palms, and has a space for grilling. It is suitable to be used as a reception lounge, and it is a friendly place where people like to meet. As usual in French Polynesia, a few meters from the house is one of the two bathroom. It has shower and washbasin in a partially covered area overlooking a natural garden in the open. Nearby are two toilets with their sink and a covered space with a washing machine and dryers. A second bathroom, partialy covered is included in the area of one of the bedrooms. 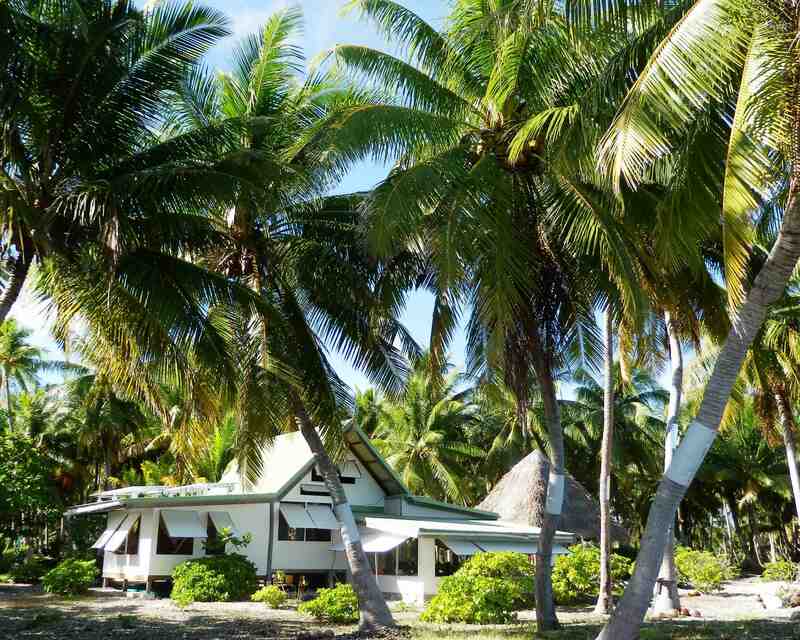 All of these facilities were built by the owners over the last decades, for their personal use, according to local standards adapted to the life in the Tuamotu. Renovation work to bring infrastructure up to the standards of modern hospitality were made ​​the end of 2013, and allowed to provide both tropical, and comfortable and modern housing conditions. Thus, although only 25 minutes by boat from the nearest village, you will have running water (hot and cold water), electricity, ceiling fans, mobile telephone network and internet. Away from the beach and the house, inside the "motu", there is a small residential home for the staff which ensures a constant presence.